I'm an EE student by trade, but I've started a project that requires some mechanical analysis, and I've run up against a bit of a wall in my calculations. The system in question that I'm looking at is an actuator, connected via ball joint to a rod, which is then connected with a ball joint to a platform. During operation, the platform will be constrained to movement in either only the x direction, or only the y direction. I'm trying to find out, based on the force of the actuator and the geometry, what the X and Y components of theses forces will be. (Apologies for the cartoonish drawing). The actuator is on the bottom left. 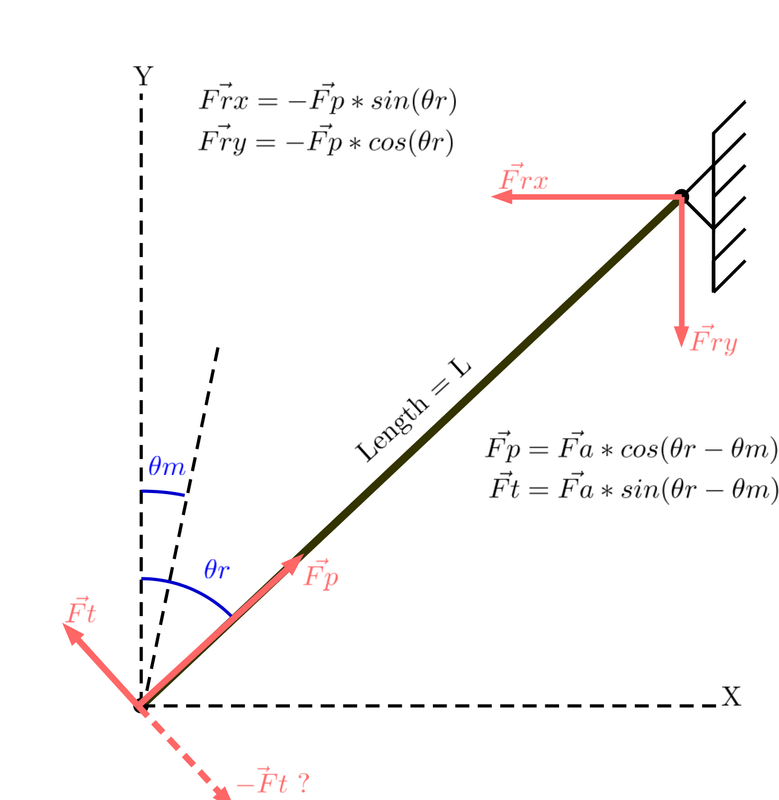 For the purposes of calculation, I'm assuming that the rod is rigid, has zero mass, and that the actuator does not need to move to apply any amount of force. I'm using static equilibrium to calculate the X and Y components of the force on the upper right hand side, which will be the X and Y force that my actuator applies to the moving platform. 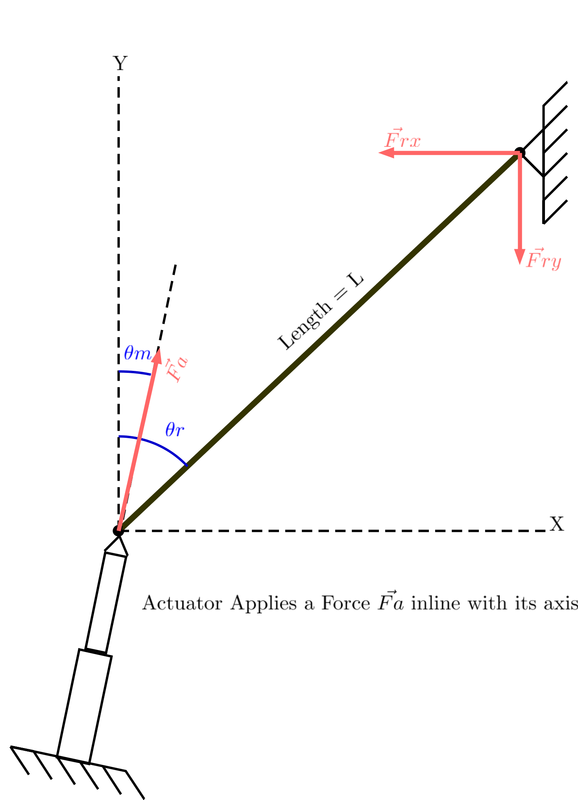 The actuator will apply an initial force Fa to the rod. Since both supported ends are ball joints, I know that there can be no moments on either end of the rod, only forces acting in-line with it. In the case of $\theta_M$ being equal to $\theta_R$, the solution is straightforward: all of the force is being applied in-line with the rod, so we set the sum of forces in X and Y equal to zero, and solve. However I'm having trouble wrapping my head around what happens if $\theta_M \neq \theta_R$. Break down the initial applied force into components that are parallel with the rod, and components that are perpendicular to the rod. Here's the part I'm unsure about. 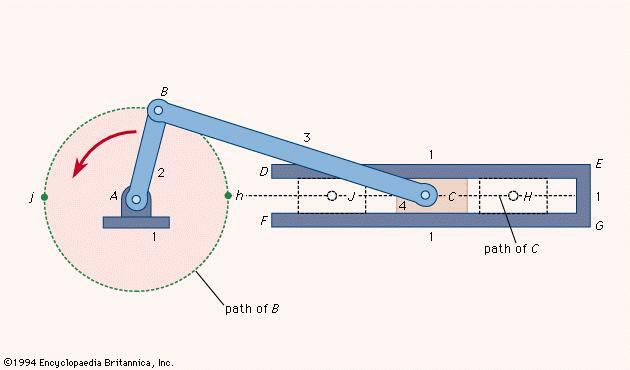 Since the actuator can't move, the perpendicular force should be cancelled by an equal and opposite normal force of the actuator pushing back against the rod, correct? However something in the back of my head is telling me that I'm missing something. Intuitively, if we were to apply the actuator force not in-line with the axis of the rod, I'd think that there would be some kind of lever action present. An example would explain what I'm trying to say best I think. Can I not analyze a system like this statically? Or am I just completely off base? If the wheel is driving the slider, won't the output force of the slider be at its peak value when members 2 and 3 are near parallel to one another? I feel like the same effect should be at play in my system above, but I don't know how to mathematically articulate that. Or my intuition about when the force is at peak value could be totally wrong. This does indeed give you a multiplying effect as the difference in angles approaches 0. Not the answer you're looking for? Browse other questions tagged statics dynamics or ask your own question. Why is friction force is not considered as centripetal force? Failure due to shear stress on rod lip? Can a simple application of two forces have two different outcomes on a rigid body?